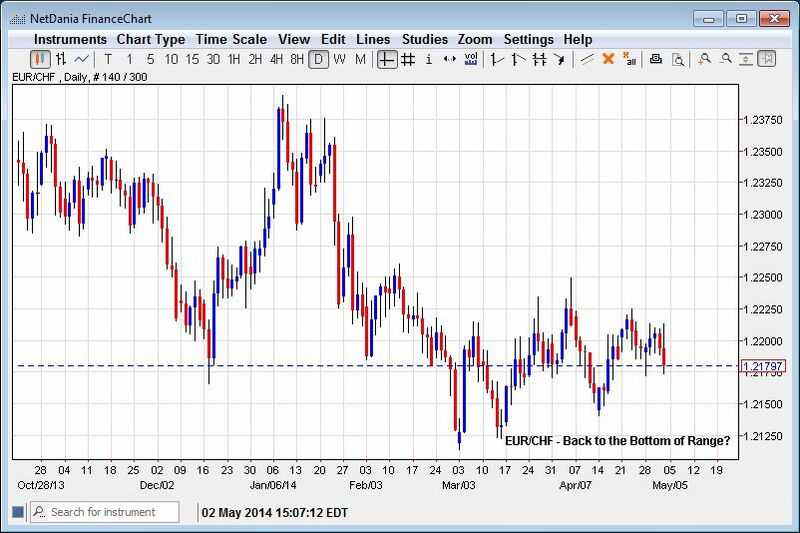 EUR/CHF – Back to the Bottom of the Range? Today’s sudden reversal in the EUR/CHF suggests that the pair ma have run out momentum ahead of the next week’s ECB meeting as traders may be starting to price in the prospect of possibly lower ECB rates. Although we remain sceptically that the ECB will go “negative” as that could prove to be be both a political and financial challenge the EU governing council members may feel they have no choice but to lower rates perhaps another 15 basis points as US rate continue to tumble and euro rises against the dollar. The ECB is very adamant at keeping the rate below the 1.40 level and lower the benchmark rate may be the only way for them to do it. Therefore today’s downward pressure may be signaling that dynamic and the pair could probe the 1.2150 and possibly even the 1.2100 as a result. Technically the 1.2250 level remains the cap in the EUR/CHF range and the move lower now opens up the prospect of test of 1.2150 and possibly even a break towards the 1.2100 level as the downward pressure on the pair accelerates.